Tanguy Le Bihan: Apart from developing boats for clients we assist, such as Beneteau, we sometimes work on slightly crazy projects that are a little out of the box. They may be crazy, but they do help make progress in research and they widen the field of possibilities. Prompted by the desire to create new things and make progress, we have worked on innovatively designed sailing yachts, with, for example, a very straight bow and a highly specific hull to front. Tanguy Le Bihan: The Flyer range was a super project – so different to the competition’s boats and marked by Beneteau’s very strong desire to make a distinctive impact. 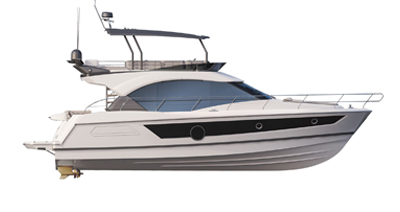 The AirStep® 2 hull, perfected by Beneteau Powerboat, has incredible seakeeping! 10 months of work was necessary for these new Flyers. What makes this type of project highly technical is that there is a weight variation of nearly 50% between a boat with no options and a full-option boat. In addition, the boat must behave exactly the same in all configurations! These are real constraints and they are increasingly present, since boats are being increasingly equipped and personalised. Such constraints render the project complicated and are very stimulating. Working with the Style&Design office was very rewarding. I am all for each person being responsible for what they know how to do best and making progress together in an intelligent fashion. With my ‘everything must serve a purpose’ engineering background, I have learnt a lot working alongside these designers. As for Patrick Tableau, we’re very complementary and it is a great pleasure to work with him. In many respects he is my mentor!